An Important Ancient Greek Textile Extremely Fine Tunic Textile fragment Woven 300-200 B.C. Purple Color Ancient Phoenicia, (present day Lebanon) were producing purple dye from a sea snail called the spiny dye-murex. Clothing colored with the Tyrian dye was mentioned in both the Iliad of Homer and the Aeneid of Virgil. The deep rich purple dye made from this snail became known as Tyrian purple. The process of making the dye was long, difficult and expensive. Thousands of the tiny snails had to be found their shells cracked the snail removed. Mountains of empty shells have been found at the ancient sites of Sidon and Tyre. The snails were left to soak then a tiny gland was removed and the juice extracted and put in a basin, which was placed in the sunlight. There a remarkable transformation took place. In the sunlight the juice turned white then yellow-green then green, then violet then a red which turned darker and darker. The process had to be stopped at exactly the right time to obtain the desired color which could range from a bright crimson to a dark purple, the color of dried blood. Then either wool linen or silk would be dyed. The exact hue varied between crimson and violet but it was always rich, bright and lasting. Tyrian purple became the color of kings nobles priests and magistrates all around the Mediterranean. It was mentioned in the Old Testament; In the Book of Exodus God instructs Moses to have the Israelites bring him an offering including cloth "of blue and purple and scarlet. to be used in the curtains of the Tabernacle and the garments of priests. The term used for purple in the 4th-century Latin Vulgate version of the Bible passage is purpura or Tyrian purple. In the of Homer the belt of Ajax is purple and the tails of the horses of Trojan warriors are dipped in purple. In the Odyssey the blankets on the wedding bed of Odysseus are purple. In the poems of Sappho (6th century BC) she celebrates the skill of the dyers of the Greek kingdom of who made purple footwear and in the play of Aeschylus (525&456 BC) Queen welcomes back her husband Agamemnon by decorating the palace with purple carpets. In 950 BC, King Solomon was reported to have brought artisans from Tyre to provide purple fabrics to decorate the Temple of Jerusalem. Alexander the Great (when giving imperial audiences as the basileus of the Macedonian Empire) the basileus of the Seleucid Empire and the kings of Ptolemaic Egypt all wore Tyrian purple. The Roman custom of wearing purple togas may have come from the Etruscans an Etruscan tomb painting from the 4th century BC shows a nobleman wearing a deep purple and embroidered toga. In Ancient Rome, the Toga praetexta was an ordinary white toga with a broad purple stripe on its border. It was worn by freeborn Roman boys who had not yet come of age curule magistrates certain categories of priests, and a few other categories of citizens. 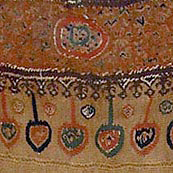 The Toga picta was solid purple embroidered with gold. During the Roman Republic it was worn by generals in their and by the Praetor Urbanus when he rode in the chariot of the gods into the circus at the Ludi Apollinares. During the Empire, the toga picta was worn by magistrates giving public gladiatorial, games and by the consuls as well as by the emperor on special occasions. During the Roman Republic when a triumph was held, the general being honored wore an entirely purple toga bordered in gold, and Roman Senators wore a toga with a purple stripe. However during the Roman Empire purple was more and more associated exclusively with the emperors and their officers. Suetonius claims that the early emperor Caligula had the murdered for the splendour of his purple cloak and that forbade the use of certain purple dyes. In the late empire the sale of purple cloth became a state monopoly protected by the death penalty. Jesus, in the hours leading up to his crucifixion was dressed in purple porphura, by the Roman garrison to mock his claim to be 'King of the Jews'. The actual color of Tyrian purple seems to have varied from a reddish to a bluish purple. According to the Roman writer Vitruvius, (1st century BC) the murex coming from northern waters probablymurex brandaris produced a more bluish color than those of the south, probably murex trunculus. The most valued shades were said to be those closer to the color of dried blood as seen in the mosaics of the robes of the Emperor Justinian inRavenna. The chemical composition of the dye from the murex is close to that of the dye from indigo and indigo was sometimes used to make a counterfeit Tyrian purple a crime which was severely punished. What seems to have mattered about Tyrian purple was not its color but its luster, richness its resistance to weather and light, and its high price. In modern times, Tyrian purple has been recreated at great expense. When the German chemist Paul Friedander tried to recreate Tyrian purple in 2008, he needed twelve thousand mollusks to create 1.4 ounces of dye enough to color a handkerchief. In the year 2000, a gram of Tyrian purple made from ten thousand mollusks according to the original formula cost two thousand euros. An Important Ancient Greek Textile 200 B.C.